A kaleidoscopic portrait of misfits, schemers, chancers, and dreamers, Jonis Agee’s bold novel is a panorama of America at the dawn of a new century. A beautiful evocation of this magnificent, blood-soaked land—its sweeping prairies, seas of golden grass, and sandy hills, all at the mercy of two unpredictable and terrifying forces, weather and lawlessness—and the durable men and women who dared to tame it. 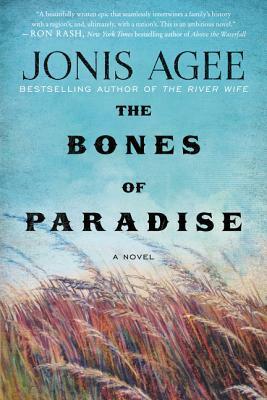 When The Bones of Paradise was picked to be this year's Omaha Reads selection, one of my book club friends quickly suggested our book club read it and even grabbed one of the library's book club bags with books for us. 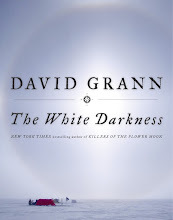 It included an audiobook copy which I took with us on a recent trip. We got through one disc (which was no reflection on the book; just new terrain that involved more concentration for driving and navigating); my husband was already saying the book was "brutal." I wouldn't have thought that would scare him off but it did; he never asked to read or listen to it again. It did not, however, scare of the ladies of my book club. Not sure if that says more about my husband or my book club friends! My husband was right; this book is often brutal. But life in the Sandhills of Nebraska in 1900 was brutal, from the weather to the people who inhabited it, and Agee's writing reflects all of the ways that life could be tough in 1900 western Nebraska, from ice storms to tornadoes to the American government to the men (and women) who lived there. As unforgiving as that land is, in Drum, J. B. and Ry Graver (who discovers the bodies of J. B. and Star) we see the lengths a person will go to to try to own their own piece of it. It makes some people harder, it breaks others, and it drives men to do things they wouldn't think themselves capable of to try to hold on to it. As the story moves back and forth in time, in part to tell the background stories of many of the characters. 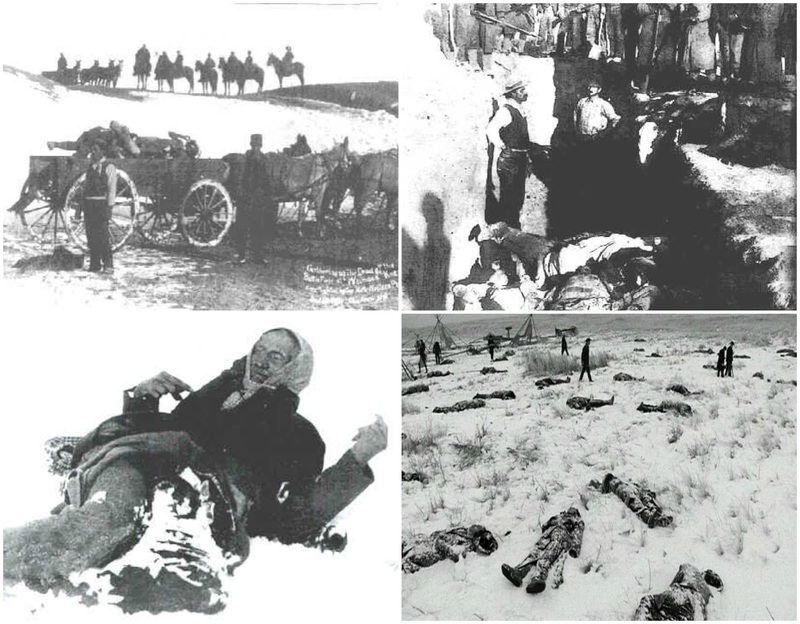 But Agee says the real reason she told the story from multiple points of view was to "respect the events and Native Americans at Wounded Knee by making them as alive and as vivid as possible...I dramatized key events with my characters involved so that the impact of the massacre could be registered as horrific as it was." There are several characters who "were there" at Wounded Knee. (Drum, J. B., Ry, and Star). 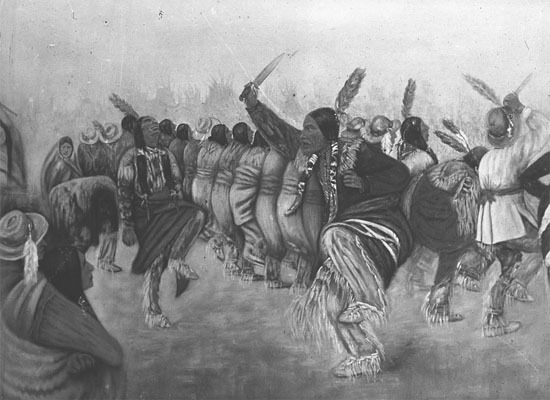 It's this day that is at the center of the book, pulling the story of what happened to the Indians in that area into the story of the Bennett family and the people surrounding them. I was glad to have read this book with a group. I had some questions when I finished and it helped to have people to bounce them off of, many of them having to do with the reason Cullen was sent to live with Drum and why Dulcinea left the ranch. I didn't entirely buy into Agee's reasoning but others in my book club found those reasons believable. All of the characters (with the possible exception of Rose) are deeply flawed and many of them are so hard that they are hard to care for. But Agee lets readers see the humanity in most of her characters and readers can understand what makes them the people they are. About those murders...there is a murder mystery element to this book, after all...some in my book club figured out early on who killed J. B. and Star. Others were holding on to their own theories until the end. Either way, the slow reveal of what happened in that meadow was satisfying. The ending of the book, though, left some (including my mom) not as satisfied. My mom said she felt like Agee had gotten to the end of the book and didn't know how to finish it so rushed into the ending that we have here. Agee, herself, says she didn't know who killed J. B. and Star when she began writing the book but that she did rewrite the ending many times. One of our book club members said, "how would you have finished the book?" I'm not sure, to be honest. I just don't think it would have ended the way Agee ended it. Still, it's a fascinating, complex novel, filled with interesting characters and dynamics, one in which the setting plays a very important role. Which, for this girl who was born in the Sandhills of Nebraska, is a very good thing. I remember reading Bury My Heart at Wounded Knee in high school. Brutal but important to know. I think this would be up my alley. I just read about the Osage County murders and that one was also brutal but such a great read. I'll have to put this one on my list.